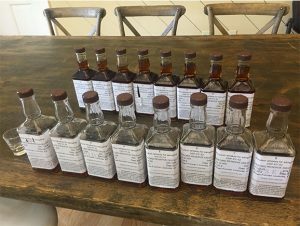 My son John and I recently returned from our annual trip to Versailles, Kentucky, where we blended seven Personal Selections Barrels at Woodford Reserve. We’ve blended our own bourbon with these good folks since 2008 and each time, the flavor profiles just get better and better. Blending bourbon is tough work—no, I really mean it. We spent a couple of days just focused on the nuances of each of the blends, shifting flavor profiles, tasting, re-blending, and tasting again to get the flavors just right. It takes mastery by the blending team to create the precise combinations, and the people at Woodford really know how to make this happen. We couldn’t make our Special Duke’s Reserve bourbon without them. One of Kentucky’s oldest and smallest distilleries, the present-day Woodford Reserve Distillery is built on history, sitting on Kentucky’s oldest distilling site where Elijah Pepper began crafting whiskey in 1812. Nestled amid the rolling hills of bluegrass and thoroughbred farms, it was on these same hallowed grounds that years later Master Distiller James Christopher Crow perfected his whiskey-making methods, which today have become common practice, including the implementation of sour mash into fermentation. These delicately blended bourbons raise the bar for restaurant blends. Our Woodford bourbon is served straight up, on the rocks, or in a number of unique cocktails developed over the years by our master bartenders. 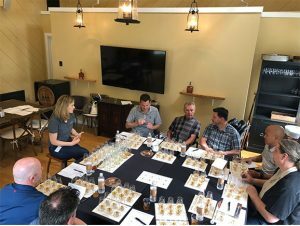 For those unaware of the differences between bourbon, whiskey, rye, etc., I turned to my friend and the true expert, Elizabeth O’Neill, master taster for Woodford Reserve. Here’s what she said, “Whiskey must follow a specific set of legal requirements to be called a bourbon. It’s unique to the United States and must be made here—but it doesn’t have to be from Kentucky. It must be made of at least 51 percent corn and feature no other flavor additives beyond water. It must be distilled at 160 proof or less and barreled at 125 proof or less only in new charred-oak barrels. Finally, it must be bottled at a minimum of 80 proof. 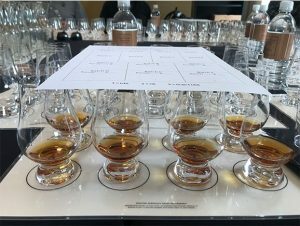 If it doesn’t meet all these rules, it’s not a bourbon.” The result is more refined, more concentrated, and with a unique, smooth taste not found in other spirits. Raise a glass of our special blended Woodford Reserve Bourbon at any of our seven locations around Puget Sound.